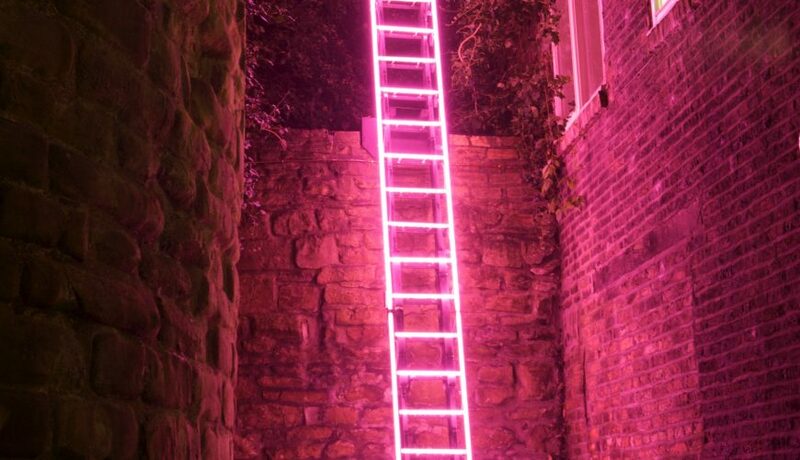 In a quiet yard next to Saddler Street, a neon pink ladder shone brightly, offering a fantasy escape route. Dreamlike, it disappeared into the vegetation above like a stairway to heaven. Ron Haselden is an international artist working with light, electronics, sound, film and other materials. He lives and works in London and in Plouër-sur-Rance, France. 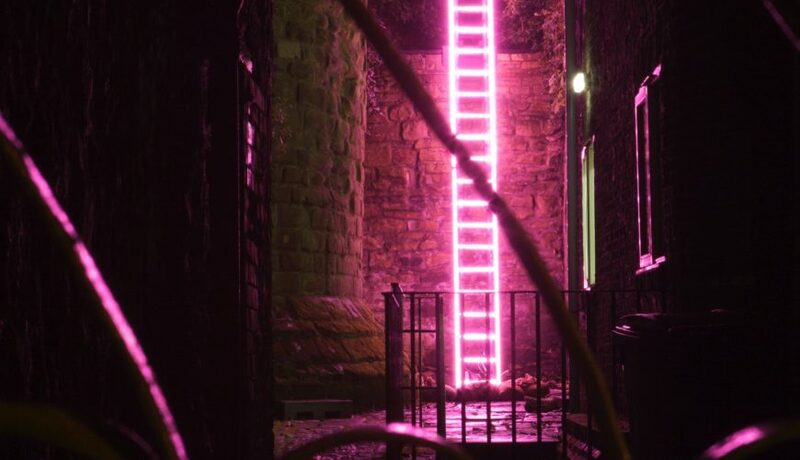 Echelle was first shown at Lumiere Durham 2009 and returned for Lumiere London 2018. Other installations by Ron Haselden for Lumiere include Nine Men Drawing (Lumiere Durham 2009), Fête (Lumiere Durham 2013 and Lumiere Derry-Londonderry 2013), Brothers and Sisters (Lumiere Durham 2011 and Lumiere London 2016) and Diver (Lumiere London 2016). 'Echelle' by Ron Haselden at 'Lumiere'. Produced by Artichoke in Durham, 2009. Photo copyright Matthew Andrews. 'Echelle' by Ron Haselden for 'Lumiere'. Produced by Artichoke in Durham, 2009. Photo copyright Matthew Andrews.